A license can be purchased for each installation of the Hoof Explorer Desktop Application. Each license purchased is available on a monthly basis. The amount entered in the shopping cart is equal to the time period, in months, for which the license is valid, beginning from the date of purchase. Please have a look at our pricing page. Please indicate the name of the individual or company this license is being purchased for, in the input box ("License to") of the personal information section in the checkout area. After purchasing a license please go to the download page to download Hoof Explorer. With your purchased license you can immediately use all the available functions. For help regarding the installation procedure please refer to our FAQ page. Hoof Explorer is an interactive application for the presentation of anatomically relevant structures of the equine foot. After buying a license you can instantly use all the features of Hoof Explorer. Please download Hoof Explorer from our download section or use the button "Download" next to the "Checkout Now" button. 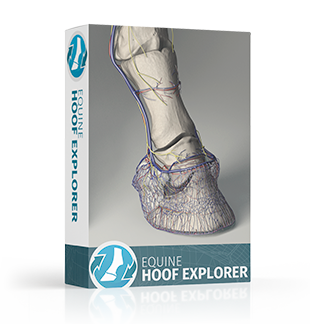 Information on installing Hoof Explorer is available in our FAQ section. Hoof Explorer is an interactive application for the presentation of anatomically relevant structures of the equine foot. The detailed 3D model of the horse hoof contains more than 150 named elements. Each of the elements can be separately picked and explored. The development of the software was scientifically supervised by the Faculty of Veterinary Medicine of the Leipzig University. The software lets you explore and analyze the model by intuitive navigation in 3D space. Different highlighting techniques and an overview map support the navigation and help with orientation. User-defined blinding-out of selected structures and configuration of transparencies in the model lets you generate any views of interest. The search function can be used as a filter and lets you query the scientific names. The scientific names of all anatomical structures can be displayed in Latin as well. The price includes software updates on a regular basis.